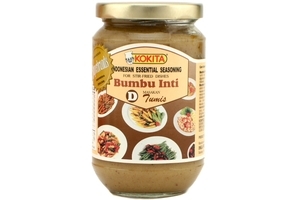 Kokita Indonesia Essential Seasoning D for Stir Fried Dishes (Bumbu Inti D Masakan Tumis) in 12.3 oz (350 gr) jar. An essential seasoning consisting of spices to prepare various Indonesian dishes. An essential seasoning to prepare indonesian stir fried dishes, mainly consisting of garlic, added with white pepper and other spices. Product of Ika Foods Indonesia. Halal Certified حلال .